So you're thinking of getting Sony's black behemoth now the price has been economically lowered to that sweet $299 price, but you're not sure if you should spring for a current system, or wait until the slim is available around September 1st? Well, our friends over at Gizmodo have come up with a list of the top 10 things you need to know about the PS3 Slim. I've placed the top 3 here - but be sure to follow the link below to view the full list. As Jason said in his hands on, the Slim isn't really stable enough to balance vertically without its stand. Problem is, the stand is sold separately, and at $24, seems over priced. You also won't be able to pick one up until 2 days after the PS3 Slim first goes on sale. 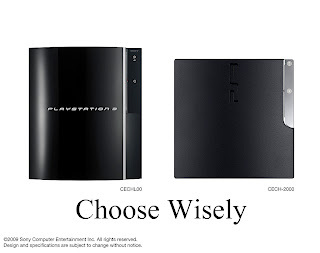 As we've mentioned, FCC records indicate that Sony may also have plans for 150GB and 250GB versions of the 120GB PS3 Slim. Either way, it only takes one screw (now located under the front, instead of the side) to swap in your own SATA laptop hard disk (and doing so won't avoid the warranty). Let us know if you have a preference?